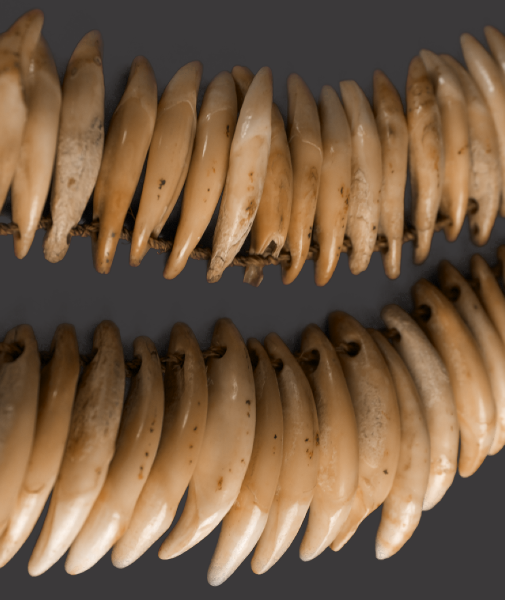 The pre-European contact natives of Hawaii were a deeply spiritual people with a powerful belief that during all aspects of their existence they were surrounded by tangible evidence of the various gods they worshipped. Manifesting themselves in earthly forms known as ‘kino lau’, they took the form of multiple animate and inanimate objects in addition to naturally occurring phenomenon such as the weather. Almost everything in life could be associated with a particular individual god. As such their presence in every day life was ceaseless. This philosophy of supernatural power existing in objects extended to the spirits of ancestors, who once passed, could transcend earthly existence and through their association with special personal possessions were able to guide, protect and help family members through the item, which was often passed through generations, it’s power or ‘mana’, increasing with age. Dogs were especially important to the early Hawaiians as an important source of meat, the native species known as the ‘poi dog’, now extinct, was believed to have been introduced by ancient Polynesian settlers who, in addition to consuming their flesh, would reputedly raise a puppy along with a baby, creating a close bond between the child and dog who acted as a protector. If the child died the dog would be killed and buried alongside however if the child outlived the dog they would take and wear its teeth as a charm, the dogs faithful spirit enduring through it, continuing it’s protection. The use of dog teeth as adornment was not however restricted to this purpose as they were an important component of various ‘hula’ implements, numbering in their hundreds, the teeth were attached to a fibre foundation panel forming the traditional leg ornament, (‘Kup’e niho ‘ilio’), worn by the dancers, as well as necklaces and bracelets, the stunning sound created by the action of the teeth knocking together accompanying the movements of the dancer. 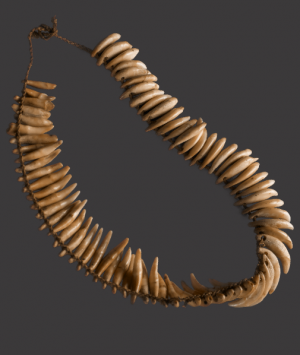 The European settlers distain and discouragement of the use of the dogs for food gradually impacted the availability of teeth. 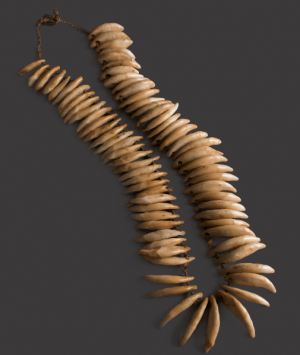 By the mid 19th Century pressure was also being exerted on the Hawaiian natives to ban the ‘hula’ altogether, which was regarded as a heathen dance. Artefacts belonging to the native Hawaiians and their way of life were eagerly sought by sailors and visitors returning home as souvenirs or by missionaries as trophies attesting their successes in subjugation. 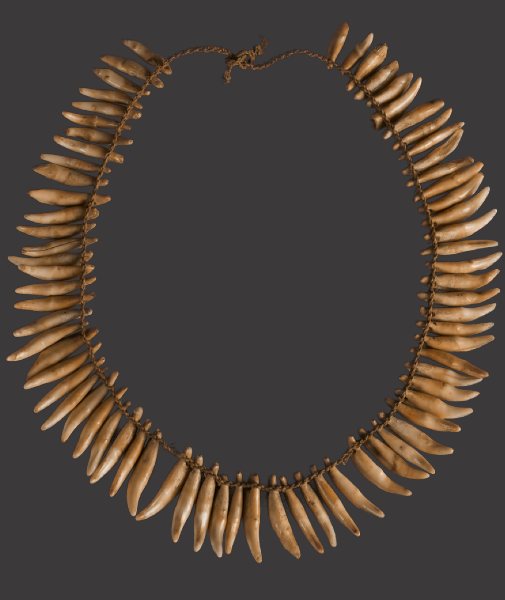 This superb necklace consists of seventy two beautifully patinated canine teeth, the perforations have been created through the root of each tooth by carefully drilling approximately half way through from either side, minimising the risk of damage and resulting in an hour glass shaped perforation. It remarkably retains its original, fine and intricately woven fibre cord. 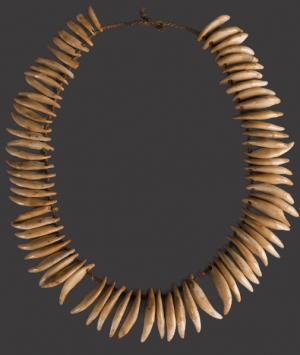 The method of creation, choice of materials and quality of workmanship perhaps contradicting some suggestions that necklaces were only intended as temporary means of gathering the teeth, intended for eventual use in creation of, kup’e niho ‘ilio’.